Plaid Cymru has warned party members they could face disciplinary action if they misuse social media. 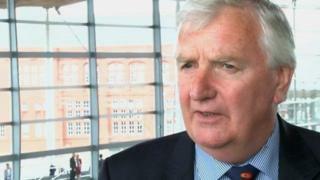 In an email, chairman Alun Ffred Jones advised against using inflammatory language or disrespecting others in the party online. It comes after a senior party member complained of “veiled threats” on social media after she signed an anti-Neil McEvoy petition. The party said the warning was in response to the social media climate. A spokeswoman said the email was not a direct reaction to events surrounding Mr McEvoy, who has been expelled from the party’s group in the assembly. In the email sent late in January, Mr Jones said social media had a “central place to play in communicating with the people of Wales”. “On the other hand we condemn any misuse of social media to criticise fellow members or launch personal attacks,” he said. “Showing each other respect is one of our core values which is reflected in our standing orders. “Any member who breaks this rule and disrespects fellow members or uses inflammatory language will be open to disciplinary measures. He added some attacks on members had come from anonymous accounts. There was no way for the party to know who the individuals are, Mr Jones said, but “remember that you can report them to the platform moderators in question if they post abusive messages”. Several days before the email was sent, former Plaid Cymru AM and ex-deputy leader Helen Mary Jones said she had faced “veiled threats, calls for my expulsion and woolly allegations about my supposed participation in some sort of imaginary conspiracy” on Facebook. She said she received the messages after she had signed a petition that was automatically shared on her page, which called for Mr McEvoy not to be reinstated to the Plaid group. It had pre-dated his expulsion. Ms Jones said it would have been better for her to have posted her support on social media, rather than have signed the petition. But she said she would not put up with “abuse and threats and insinuations” and said she would report people if needed. A Plaid Cymru spokeswoman said: “Plaid Cymru takes its respect agenda seriously.